Len Colgan 12/16 as "T. sp Tanti". Brenton Cadd ... "First flowering for me, from Peter Tristram back in 2012. By the look of the flowers and the plant itself it has close ties with T. argentina?" Len Colgan ... "I must admit that I have never heard of T. colorata. However, it does remind me somewhat of a plant I have had for many years that happens to be in flower today. A long time ago I purchased a plant from Lydia Koehres labelled "T. sp. Tanti", where Tanti is in Argentina. To both Derek and myself it looked like a T. argentina on steroids, or else a mix with some other species. Because it was so interesting, I asked Lydia to see if she could get some more during her next trip to that area. However, she could not find what I was seeking, surprisingly and disappointingly. It offsets very well, and so quite a number have found their way interstate. Can Peter or someone else shed some light on your plant T. colorata? Does it have a link with my species from Tanti?" Derek Butcher ... "'Tanti' is recorded in the BCR and does get a passing mention in the T. colorata description (see below)"
Chris Larson ... "'We sourced a number of T. colorata in Europe in different imports, some with dark foliage & some with green foliage. It’s a pretty little plant. Tanti is quite a way south of Cafayete. But makes you wonder when it can’t be found again in Tanti. Has T. Tanti been compared to T. colorata? I noticed it was registered 3 years before T. colorata was described. Brent, I’d be comparing it with the description of T. colorata before considering it T.Tanti. I collected larger forms of T. argentina (larger than the description), but not quite the same as T. colorata – that is, I’d still call them T. argentina." 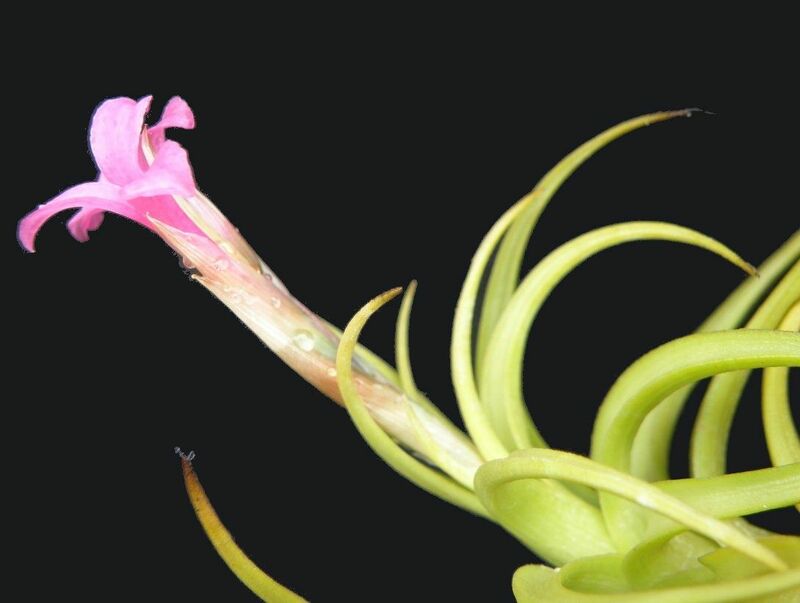 Brenton Cadd ... "Thanks for all of this information it is very interesting and it leads me to believe that my plant is in fact Tillandsia colorata fo. flavescens. My plant has a distinctive yellow green look to the leaves. The photos I posted were taken while the plant was still wet from its weekly watering and that makes it look greener than it really is. I will see if I can photograph it again and catch the color, it is certainly more yellow than any of the plants around it. Perhaps Len Colgan's plant is the true T. colorata as it looks greener? That would be good as then we would have both plants here in Ozz." A T. argentina C.H. Wright caulo usque ad 10 cm longo, vaginis foliorum basi 20 mm latis extus lepidotis, laminis foliorum basi 10 mm latis, vinosis vel flavoviridibus, foliis pedunculi 3-7 cm longis spicam attingentibus, bracteis florigeris 30 mm longis, filamentis non plicatis et pistillo longiori differt. Typus: Argentina, Provincia Salta, Dept. Cafayate, Quebrada Colorada, 1700 m s. m., 26.7.1981, K & L. Hromadnik HR7201 (holo MCNS, iso WU). Paratypus: L.c., 26.7.1981, E. Markus s. n. (WU). Plant short stem-forming, in small groups, cushion like, on steep rocks, flowering up to 25 cm high, with strikingly coarse, long and branched roots. floral bracts membranaceous, glabrous, veined, 25-32 mm long, at the base 7 mm wide, narrowly lanceolate, olive-green, towards apex wine-red. ovary 5 mm high, 2.5 mm in diam., green; style and stigma white, stigma type 1 according to Brown & Gilmartin (1984), with thread-like, reflexed stigmatic lobes. Next to the type with brightly coloured rusty brown to wine red leaves, the species was named after T. colorata, at the same locality there is another in colour deviating form, namely HR 7202, which is named herein too. Tillandsia colorata fo. flavescens L. Hrom., fo. nov.
A forma typica foliis flavoviridibus differt. 26.7.1981, H. & L. Hromadnik HR 7202 (holo MCNS, iso WU). Tillandsia colorata fo. flavescens is consistent with the most of the characters of the typical form, but exposes an extraordinary yellowish green colour of the leaves. The irregular, angular shape of the scales on the leaf bearing a very narrow ring of short marginal (wing) cells is clearly visible in this form. Tillandsia colorata is known from the Quebrada Colorada, province Salta only, where it grows on steep rock faces at an elevation of about 1700 m, accompanied by Parodia penicillata and T. argentina. Here, both forms of T. colorata and the olive grey leaved T. argentina form interesting plant communities of numerous low cushions of different colour. Transition forms are not known. 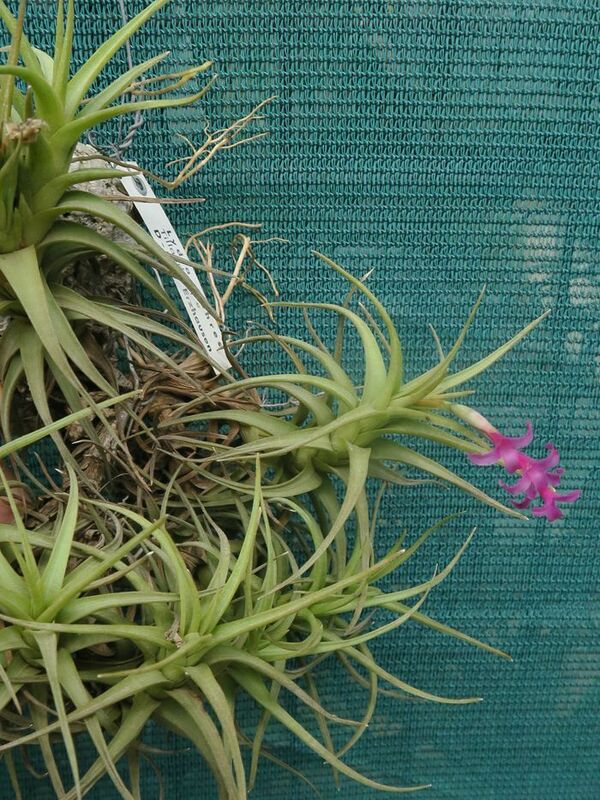 For the first glance, T. colorata may appear just as a form of T. argentina, especially during flowering. Compared with the latter, the plants discussed possess numerous differences, giving enough reasons for describing them as a new species. This is supported by the sympatric distribution. Intermediate forms could not be found. 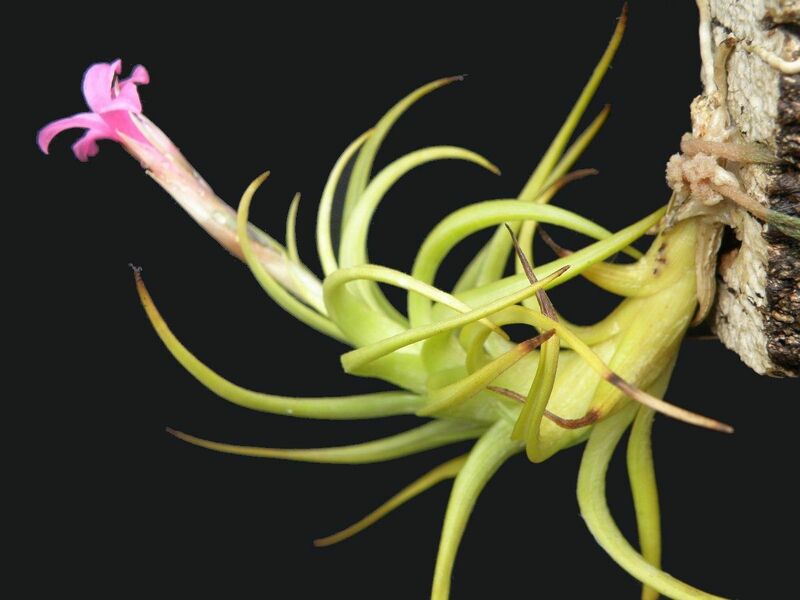 Like other closely related Andean species like T. friesii and T. markusii, T. colorata is relatively slow growing and rarely flowering in cultivation. 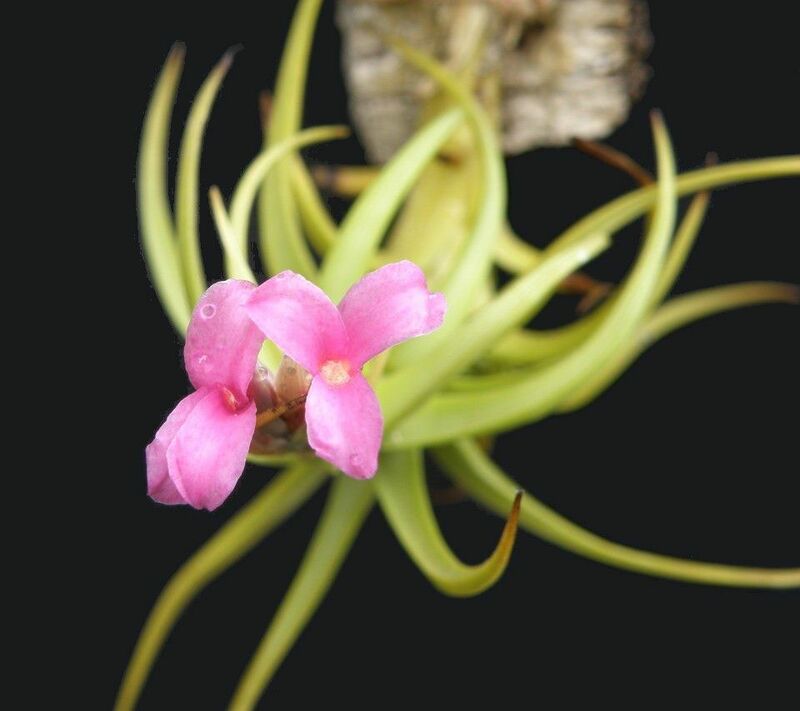 Tillandsia argentina is well known and frequently present in collections. Formerly, it was often called T. unca. Grisebach (1874) described a T. unca, but the type (Stelzner s. n., Aug-Sep 1872, Brazil: Parana (CORD, GOET)) belongs to T. aeranthos (basionym: Pourretia aeranthos Loisel., 1821). In 1879, he published again a “T unca”, at that time already a nom. illeg. Moreover, the type (Hieronymus s.n., no date, Argentina (G)) belongs to T. ixioides (Grisebach, 1879). Baker misunderstood the name “T. unca Grisebach (1879)” and listed as type “Lorentz” (Baker 1887) resp. “Lorentz & Hieronymus 638” (Baker 1889: 165). According to Smith & Downs (1977: 822) this collection is not a type. Vouchers in CORD, GOET, NY belong to T. ixioides. Probably further existing specimens in BM and K (compare Baker 1889: vii) are not available at the moment. If belonging to T. argentina, “Lorentz & Hieronymus 638” would be a mixed collection, from which Baker only saw these two or one of these vouchers. Eventually, by C.H. Wright (1907), a collection from the Argentinean province of Cordoba (Stuckert s.n., 1903) got the valid name T. argentina. 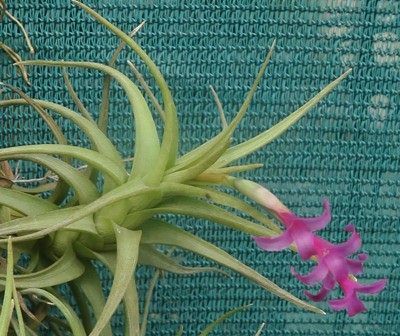 Tillandsia argentina is widely distributed in northern and central Argentina, but there are also several collection localities known from Bolivia. The distribution area stretches from the southernmost province Tarija in Bolivia north-eastwards to the departamentos Chuquisaca and even Santa Cruz. Here it grows scattered along the rim of the Andean mountains on vertical rocks of some certain valleys, where it was found to the surroundings of the places Monteagudo and Cuevo. Tillandsia argentina can colonise trees, but mostly it is found on rocks. In Argentina at some places, it is found growing on columnar cacti, which are sometimes sympatric with T. xiphioides Ker-Gawl. var. xiphioides - covered by dense stands. During flowering time it must be a gorgeous look. In Bolivia T. argentina dwells altitudes between 1000 m and 1800 m, in Argentina it is distributed between 800 m and 2000 m, i.e., also in areas where frost occurs. Despite their wide distribution, T. argentina varies little. The plants from the different localities are all stemless and differ at most by slightly longer or shorter leaves or inflorescences in size or by more coarse or slender leaves in habit. Typical for all forms are the stiff, dark olive-green, appressed lepidote leaves, which are keeled at the abaxial side of the lamina. Even the inflorescences, always consisting of a single, more or less sessile spike, expose no significant differences. The flowers are at best lighter or more intensive carmine red. Nevertheless, in some few, always on rocks growing forms, some obvious differences can be observed, e.g., in a collection of Kohres in 1988, close to Tanti, province Cordoba, by secund leaves. Rarely, between the different localities, there are minor differences in leaf colouration. On the other hand, there are species from that relationship possessing a clearly different habit and deviating characters. All are exclusively rock dwellers and grow outside of the distribution area of T. argentina, like, e.g., T. hasei R. Ehlers & L. Hrom. (1996) isolated in high altitudes and geographically far away from related species, or, like T. markusii L. Hrom. (2002) and T. friesii Mez (1906) at about 3000 m alt., where T. argentina doesn't occur anymore. While inflorescences of that species complex are nearly identical, e.g. T. friesii differs by its longer stems and silvery grey leaves. The plants of a population on rocks from the more remote surrounding areas of Cafayate are stem-forming as well. We discovered them because our travel-mate and cacti-enthusiast Ernst Markus wanted to investigate a remote valley. The plants grew in two forms on steep rocks in the so called Quebrada Colorada together with T. argentina and the globular cactus Parodia penicillata Fechser & Steeg which is armed by golden thorns. Doubtlessly, they are related to T. argentina. With regard to the long stems, they seem to be closest to T. friesii, but differ from that species by conspicuous wine-red or yellowish green leaves and the spreading and longer leaves. These plants are named for their extraordinary colouration as T. colorata respectively as T. colorata fo. flavescens.